Anthology for german student's of English: has footnotes explaining vocabulary deviating from plain English. First edition; assumed first printing, since no higher printing indicated. 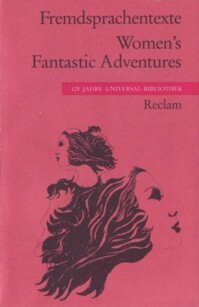 Small-size paperback: height is slightly less than 15cm. Part of sub-series 'Fremdsprachentexte' (= foreign language texts) of Universal-Bibliothek. An editorical note is on p. 165; sources for the shortfictions are listed on p. 166. Short author's bio-bibliographies are on pp. 167ff. ; contents on p. 188. The bio-bibliographies and the afterword are in German. No credit for cover art, no visible signature. 32 • The Women Men Don't See • (1973) • novelette by James Tiptree, Jr.